If you're of Sicilian descent you may have wondered why you have several cousins with the same name, or why your grandmother got so upset with your uncle Joe's 'mirican' wife Bethany because she named their first son Ryan (!!!) instead of Calogero, after your Sicilian grandfather. The SICILIAN NAMING CONVENTION (SNC) is a practice that was employed by most Sicilian and Southern Italian families up until the early twentieth century, for selecting the given names of children. It was not a legally binding custom, but was so strong that it was thought to be so by many. the second daughter would be named after the wife's mother, the girl's maternal grandmother. The reason for this custom was simple and almost visceral: to carry on a bit of a beloved ancestor's "soul" in the form of that ancestor's namesake, who eventually would have his or her own grandchildren, who would in turn carry the name to further future generations. Unlike the American practice, it was not customary for parents to name their children after themselves, especially not before the SNC was satisfied. But after a man had several children, all named according to the convention, or other variations I'll cover here, it was acceptable for a younger son to be given his own father's name. This was especially true if a man became sickly, or was away from home with the possibility that he would not return (e. g. in military service, or emigrated to America). And if a man should die while his wife was pregnant, the resulting child would be named after her deceased husband, regardless whether the naming convention was broken by doing so. Further, the child would be named after its father regardless of its gender: a girl would simply be given the feminine version of the name. So if Gaetano died before his child was born, the baby would be named Gaetano if it were a boy, but Gaetana if a girl; the deceased Angelo's child would be named Angelo or Angela; Calogero's baby would be Calogero or Calogera, and so on. Other situations could allow the convention to be broken. If a dear friend or relative other than a grandparent should die shortly before the birth of a couple's child, it might be acceptable to name the child after that person; or if a saint had been prayed to and had granted the couple a special favor, a child might be named "out of order" after the saint. In these cases as well, the child's name might be modified according to gender. I, for example was named Angelo after my mother's sister Angela, who passed away before I was born. Another intriguing, if unusual, custom was followed. If a man married and had several children by his first wife and she passed away, usually he re-married almost immediately: his orphaned children needed a mother. If the second wife bore children, the man's first child by his second wife would be named after his first wife! This seems strange, and would certainly never be permitted by an 'American' second wife, but it was the Sicilian custom. When we consider that it was a way to honor the dead woman, who would produce no more offspring and thus have a reduced chance that her name would live in posterity, it can be seen to be a compassionate tradition. If you ask "Why would any woman agree to have her child named after her husband's first wife?" The reason is evident. Because if the second wife died, she knew the man's next child would be named after her! In my own family, my father's brother Antonio Coniglio, my uncle, married a woman named Antonina Andolina. They had several children, duly named in the Sicilian naming convention. Then Antonina died. My uncle soon re-married, a woman named Giuseppa Verdone. They had a son, who they named Antonino (the masculine version of Antonina, the first wife's name). Sadly, the baby boy died as an infant. Giuseppa had another child, a girl. They named her Antonina. This reveals another practice, that of giving new children born after the death of a child the same name as the recently deceased sibling. Contrary to some belief, the subsequent child was not "named after the dead child", but it was named after the same grandparent or other person that the previous child had been named for, assuring that the name would continue in posterity. Sometimes a couple would have several children who died at or near birth, one after the other. If the children were all girls, for example, and first was named after a grandmother, Carmela, each of the new babies (I have seen records for as many as three and four in a row) would be named Carmela, until one survived past childhood. Indeed, if an eldest son was named, say Giuseppe, after his paternal grandfather, and lived to be ten or twelve, with subsequent siblings properly named, and then Giuseppe died, the next son born would be named Giuseppe! The name must be carried on. Sometimes a search of ancestral records shows several children for a couple, but the first son for whom records are found was named after the maternal grandfather, and the paternal grandfather's name did not appear until a later son was named. In such cases, you should search for records of earlier births. The likelihood is that a first son was properly named, then died, and a later son was then given the paternal grandfather's name. The Sicilian naming convention is charted below. It was also used in Greece, and in parts of Ireland, where it was extended so that a man's third son was named after the man himself, and the third daughter was named after her own mother, the man's wife. I have found records that confirm that this convention was used in many of the towns of Sicily, back at least as far as the 1700's, six or seven generations back. The custom was so ingrained that if a man did NOT name his first son after his father (without good reason, as outlined above), or his second son after his father-in-law, etc., it was considered a serious insult and could lead to shunning or virtual disinheritance by the family. 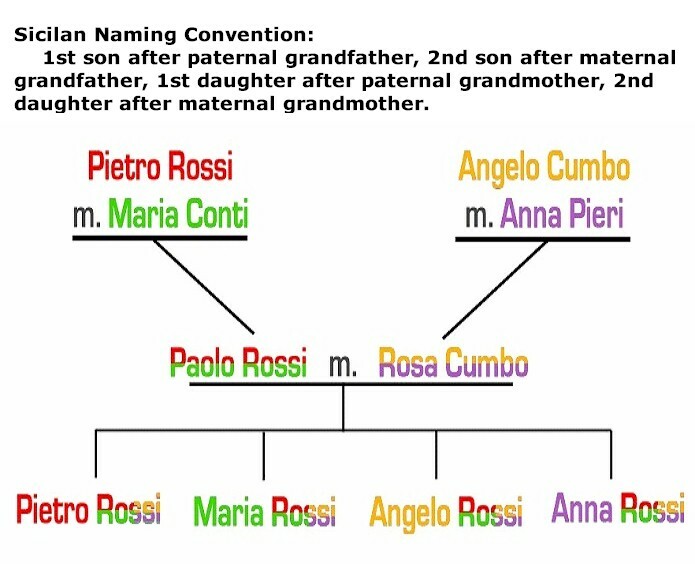 Now, if a man had five sons, and they eventually married and each had sons of their own, using the example in the chart, Pietro Rossi and Maria Conti would have five grandsons, all named Pietro Rossi: five first cousins with identical names! The naming convention actually goes further than the four primary names indicated above. In addition, names were often chosen to match the names of a child's uncles and aunts ~ the siblings of its parents. The third son was named after the father's eldest brother; third daughter after his eldest sister. The fourth son was named after his wife's eldest brother; fourth daughter after his wife's eldest sister, and so on. Since the siblings of the couple had also been named according to the SNC, this resulted in the couple's children actually having names of their great-grandparents! This repetition can cause problems when, generations later, a person tries to untangle his family genealogy. The person might ask "Which Pietro Rossi was my ancestor?" Though sometimes confusing, the fact that families used the SNC can actually help in genealogical research. For example, someone may say "I want to research my family, but I don't know my paternal great-grandfather's name." I ask "Was your father an eldest son? If not, what was his eldest brother's name; your eldest uncle's name?" That name would then have been the person's great-grandfather's name. Other ancestors in that generation would have had names consistent with the person's other uncles and aunts. When searching old records, then, we look for ancestral names that match more recent given names in the family. Similarly, if you think you have found a distant, previously unknown branch of the family, that possibility is enhanced if the given names in that branch match some of the ancestral names. If your great-grandfathers were named Calogero, Giuseppe, Gaetano, and Vincenzo, you should have some second or third cousins named Charley, Joe, Guy or Tom, and Vinny or Jimmy. That is, until the family got to America and started naming their kids after movie stars, days of the week, fruits, plants, and so on! So after generations of naming children after a strict code, is it any wonder that our Sicilian mothers or grandmothers could not understand why their sons didn't follow the age-old tradition? My mother Rosa Alessi, bless her soul, had six sons. Five of them married and had sons. My father's name was Gaetano Coniglio, so this should have led to five grandsons, all named Gaetano Coniglio, or at least "Guy"! But only my eldest brother named his son after our father. My mother's other first-born Coniglio grandsons are named Raymond, John, Anthony and Angelo. Before I understood the Sicilian convention, I thought my mother was being unfair when she felt hurt by her daughters-in-law (some who were not Sicilian) because of these names. Now I realize that she was simply confused and disappointed that a custom that had lasted centuries had been abandoned. But she still loved those grandsons with all her heart!